After the Isle of Jura Writers Retreat post this morning I created and posted another panorama, this time a 360° Quicktime VR panorama of Lossit Bay on Islay's west coast. The pictures for it were taken a few minutes before the picture above. Later in the afternoon I drove to an outdoor shop to buy a second pair of boots in preparation for the upcoming WalkIslay walking week. Also had a short afternoon walk, if the weather on Islay is anything like what we had here in southern England today we'll have another very nice walking week. Sunny and warm. 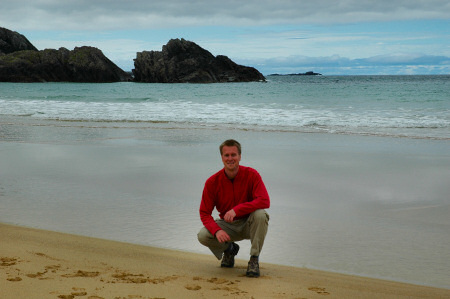 The Bruichladdich blog is already writing about a drought on Islay and predictions that it will continue for a while. This evening I did some work on the Lossit Bay and the Rhinns of Islay page for the Scotland Summer 2006 travelogue. Making good progress, expect to complete at least that page this weekend. And now I'm posting the Friday Islay Picture before turning off the computer and going to bed.